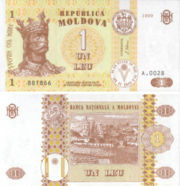 1 Moldovan is commonly considered another name for Romanian ( Gagauz and Russian are also official in the Gagauz Autonomous Region). 22004 census and 2006 estimate from National Bureau of Statistics. Figures do not include Transnistria and Tighina. 3Ranking based on 2005 UN figure including Transnistria. The Republic of Moldova (Republica Moldova) is a small landlocked country in eastern Europe, located between Romania to the west and Ukraine to the east and south. Historically part of the Principality of Moldavia, it was annexed by the Russian Empire in 1812 and reunited with other Romanian lands in Romania in 1918. After changing hands during World War II and ultimately being annexed by the Soviet Union, it was known as the Moldavian SSR between 1945 and 1991 and finally declared its independence on 27 August 1991. The Republic of Moldova is a member state of the United Nations, WMO, UNICEF, GUAM, CIS, BSEC and other international organizations. Moldova is a parliamentary democracy with a President as its head of state and a Prime Minister as its head of government. Moldova's territory was inhabited in ancient times by Dacians. Due to its strategic location on a route between Asia and Europe, Moldova has suffered from several invasions, including those of the Kievan Rus' and the Mongols. During the Middle Ages the territory of Republic of Moldova (including most of present-day Moldova but also including districts to the north and south, known as Northern Bukovina and Budjak) formed the eastern part of the principality of Moldavia (which, like the present-day republic, was known in Romanian as "Moldova"). The principality became a tributary to the Ottoman Empire during the 16th century. According to the Treaty of Bucharest in 1812, the territory passed to Russia together with Budjak (Southern Bessarabia). At first, the Russians used the name " Guberniya of Moldova and Bessarabia", but later called it simply Bessarabia. The western part of Moldavia remained an autonomous principality and united with Wallachia to form the Old Kingdom of Romania in 1859. Following the Russian Revolution of 1917, Bessarabia proclaimed independence from Russia in 1918, and united with the Kingdom of Romania the same year. Transnistria, did not join Romania and formed the Moldavian ASSR, (1924-1940). In accordance with the June 1940 Ribbentrop-Molotov Pact with Nazi Germany, the Soviet Union forced Romania to evacuate its administration from Bessarabia and Northern Bukovina and immediately annexed these territories. Although Soviet troops were forced out in 1941 by the invasion of Axis forces, the Soviet Union re-occupied and annexed the area in August 1944. Soviet rule brought a harsh de-nationalization policy. The southern and northern parts (which had significant Slavic and Turkic minorities) were transferred to Ukraine. At the same time, Transnistria (where, at that time, ethnic Romanians were the largest ethnic group) was joined with the remaining land to form the Moldavian Soviet Socialist Republic, identical in territory to present-day Moldova. Under Stalin, ethnic Russians and Ukrainians were encouraged to immigrate into the new country, especially into urbanized areas, while large numbers of ethnic Romanians were deported to Siberia and Kazakhstan. The overall result was the destruction of Romanian elites and middle-classes, and their replacement with Soviet (mostly Slavic) elements. After the Soviet Union occupied the region of Bessarabia during World War II, the Soviet government began a campaign to promote a Moldovan ethnic identity, different from that of the Romanians, based on a theory developed during the existence of the Moldovan SSR. The Soviet official policy also stated that Romanian and Moldovan were two different languages and Moldovan was written in Cyrillic alphabet, as opposed to Romanian, which was written in Latin alphabet. In 1970s and 1980s Moldova received substantial investment from the budget of the USSR to develop industrial and scientific facilities, as well as housing. In 1971 the Council of Ministers of the USSR adopted a decision "About the measures for further development of Kishinev city" that secured more than one billon rubles of investment from the USSR budget. Subsequent decisions that directed enormous wealth and brought highly qualified specialists from all over the USSR to develop Moldova. These investments stopped in 1991 with the dissolution of the Soviet Union, when Moldova became independent. Along with the other peripheral Soviet republics, Moldova started to move towards independence from 1989 onwards; in August 1989 a language law was passed, adopting the Latin alphabet for Moldovan and declaring it the state language of the MSSR . In August 1991, Moldova declared its independence and in December of that year became a member of the post-Soviet Commonwealth of Independent States along with most of the former Soviet republics. At the end of that year, an ex-communist reformer, Mircea Snegur, won an election for the presidency. Four months later, the country achieved formal recognition as an independent state at the United Nations. The part of Moldova east of the Dniestr River, Transnistria—which is more heavily industrialized and is populated by a larger proportion of ethnic Russians and Ukrainians— claimed independence in 1990, fearing the rise of nationalism in Moldova and the country's expected unification with Romania. This caused a brief military conflict between Moldova and Transnistria in 1992, which resulted in the deaths of more than 1,500 people and has caused lingering mistrust between political forces on both sides of the conflict. Russian and Ukrainian forces intervened on the Transnistrian side, and Russian troops of the 14th Army remain there to this day. Negotiations between the Transnistrian and Moldovan leaders have been going on under the mediation of European Union, OSCE, USA, Russia and Ukraine. Despite expectations of the Popular Front, Moldova did not unite with Romania in 1991. In the early 1990s, the future of Moldova was a source of tension in Romania's relations with Russia. Russian President Boris Yeltsin's government did not want to see one of the former Soviet republics on Russia's frontier joined to another country. A March 1994 referendum saw an overwhelming majority of voters favoring continued independence. In the 2001 elections a pro-Russian Communist party won the majority of seats in the Parliament and appointed a Communist president, Vladimir Voronin. After few years in power relationships between Moldova and Russia deteriorated over the Transnistrian conflict. In the following election, held in 2005, the Communist party made a 180 degree turn and was re-elected on a pro-Western platform, with Voronin being re-elected to a second term as a president. During the 2005 parliamentary elections Russia tried to influence the election process by intensively favourable coverage of pro-Russian candidates in the Russian mass media and by organizing meetings and agitation campaigns using the Russian CIS-EMO organization (“Elections Monitoring Organization”), which is not recognized internationally as an independent election observer. This organization was proven to have poor records from the previous Kyrgyzstan election. As a response to the security threat, Moldovan authorities denied entry to the Republic of Moldova for the members of the CIS-EMO organization. Some who nonetheless made their way into the Republic were found distributing leaflets and actively participating in the election campaign, despite not having a valid Moldovan passport or any proof of Moldovan citizenship or any permission from the election authority. These members were consequently deported from the country. This action angered the Russian side. As a consequence, Russian-Moldovan ties greatly weakened, and the nation is split between those who favour building ties with the West and those who favour building ties with Russia. 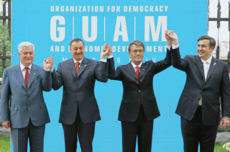 Meeting of Presidents from GUAM countries; Voronin, Aliev, Yushchenko and Saakashvili. In the address to the Romanian parliament, in February 1991, Mircea Snegur, the Moldovan president talked about a common identity of the Moldovan and Romanians, referring to the "Romanians of both sides of the Prut River" and "Sacred Romanian lands occupied by the Soviets". In 1989, Romanian became the official language of Moldova. Following independence in 1991, the Romanian tricolor with a coat-of-arms was used as flag, and Deşteaptă-te române!, the Romanian national anthem, also became the anthem of Moldova. In those times, there was an expectation among certain groups in both countries that they were to be united soon, and a Movement for unification of Romania and the Republic of Moldova began in both countries in the early 1990s. However, the initial enthusiasm in Moldova was tempered and starting in 1993, Moldova started to distance itself from Romania. The constitution adopted in 1994 used the term "Moldovan language" instead of "Romanian" and changed the national anthem to Limba noastră. The 1996 attempt by Moldovan president Mircea Snegur to change the official language to "Romanian" was dismissed by the Moldovan Parliament as "promoting Romanian expansionism". The government has stated that Moldova has European aspirations but there has been little progress toward EU membership. On May 1, 2004 many EU enthusiasts waving the EU flags found their flags confiscated by police and some were arrested under the clause of "anti-nationalism." During her first bilateral visit to Moldova, European Commissioner for External Relations and European Neighbourhood Policy, Benita Ferrero-Waldner opened the new Delegation of the European Commission to Moldova on 6 October, to be headed by Cesare De Montis. A Partnership and Cooperation Agreement (PCA) with EU is the legal basis for EU relations with Moldova. The PCA came into force in July 1998 for an initial period of ten years. It establishes the institutional framework for bilateral relations, sets the principal common objectives, and calls for activities and dialogue in a number of policy areas. Moldova welcomed EU enlargement and signed on 30 April 2004 the protocol extending the PCA to the new EU member states. With the joint adoption of the EU-Moldova Action Plan on February 22, 2005, the EU and Moldova have further reinforced their bilateral relationship, providing a new tool to help implement the PCA and bring Moldova closer to the EU. The TACIS programme is used as the framework for technical assistance to support agreed objectives. 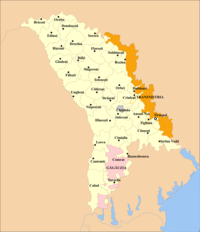 Transnistria is a de jure part of Moldova, as its independence is not recognized by any country, although de facto it is not controlled by the Moldovan government. The largest part of the country lies between two rivers, the Dniester and the Prut. Moldova's rich soil and temperate continental climate (with warm summers and mild winters) have made the country one of the most productive agricultural regions and a major supplier of agricultural products in the region. The country is landlocked, even though it is very close to the Black Sea. While the northern part of the country is hilly, elevations never exceed 430 metres (1,411 ft)—the highest point being the Dealul Bălăneşti. The country's main cities are the capital Chişinău, in the centre of the country, Tiraspol (in Transnistria), Bălţi and Tighina. Moldova enjoys a favorable climate and good farmland but has no major mineral deposits. As a result, the economy depends heavily on agriculture, featuring fruits, vegetables, Moldovan wine, and tobacco. Moldova must import all of its supplies of petroleum, coal, and natural gas, largely from Russia. Energy shortages contributed to sharp production declines after the breakup of the Soviet Union in 1991. As part of an ambitious economic liberalization effort, Moldova introduced a convertible currency, freed all prices, stopped issuing preferential credits to state enterprises, backed steady land privatization, removed export controls, and freed interest rates. The government entered into agreements with the World Bank and the IMF to promote growth. Recent trends indicate that the communist government intends to reverse some of these policies, and recollectivise land while placing more restrictions on private business. The economy returned to positive growth, of 2.1% in 2000 and 6.1% in 2001. Growth remained strong in 2002, in part because of the reforms and because of starting from a small base. Further liberalization is in doubt because of strong political forces backing government controls. The economy remains vulnerable to higher fuel prices, poor agricultural weather, and the skepticism of foreign investors. Following the regional financial crisis in 1998, Moldova has made significant progress towards achieving and retaining macroeconomic and financial stabilization. It has, furthermore, implemented many structural and institutional reforms that are indispensable for the efficient functioning of a market economy. These efforts have helped maintain macroeconomic and financial stability under difficult external circumstances, enabled the resumption of economic growth and contributed to establishing an environment conducive to the economy’s further growth and development in the medium term. Despite these efforts, and despite the recent resumption of economic growth, Moldova still ranks low in terms of commonly-used living standards and human development indicators in comparison with other transition economies. Although the economy experienced a constant economic growth after 2000: with 2.1%, 6.1%, 7,8% and 6,3% between 2000 and 2003 (with a forecast of 8% in 2004), one can observe that these latest developments hardly reach the level of 1994, with almost 40% of the GDP registered in 1990. Thus, during the last decade little has been done to reduce the country’s vulnerability. After a severe economic decline, social and economic challenges, energy uprooted dependencies; Moldova continues to occupy one of the last places among the European countries according to the income per capita. In 2002 (Human Development Report 2004), in Moldova the registered GDP per capita was US $381 equivalent to US $ 1,470 PPP, which is 5.3 times lower that the world average (US $ 7,804). Moreover, GDP per capita is under the average of all regions in the world, including Sub-Saharan Africa (US $ 1,790 PPP). In 2004, about 40% of population were under the absolute poverty line and registered an income lower than US $ 2.15 -purchasing power equivalent- per day. Moldova is classified as medium human development and is placed on the 113 spot in the list of 177 countries. The value of the Human Development Index (0.681) is below the world average. Moldova remains the poorest country in Europe in terms of GDP per capita: $ 2,500 in 2006. Critics accuse the government of Moldova of having a poor human rights record, accusing it of interference with political freedom and of arbitrary arrest and torture. The United States Senate has held committee hearings on irregularities that marred elections in Moldova, including the arrest and harassment of opposition candidates, intimidation and suppression of independent media, and state run media bias in favour of candidates backed by the Moldovan Government. State media coverage of the street protests in 2002 regarding the communists’ attempt to reinstate obligatory study of the Russian language and the defend of the cultural identity that the majority of Moldovans share with neighboring Romania was censored. In February 2002, in response to severe censorship of the state broadcaster Teleradio-Moldova (TVM), hundreds of TVM journalists went on strike in solidarity with the anti-communist opposition. In retribution, a few journalists and staff members were dismissed or suspended from the station in March. However, in 2004 an improvement was done and the Moldovan Parliament removed Article 170 from the country's Criminal Code. Article 170 called for up to five years imprisonment for defamation. According to the OSCE, the media climate in Moldova is restrictive. Authorities continue long-standing campaign to silence independent opposition voices and movements. In a case widely criticized by human rights defenders, opposition politician Valeriu Pasat was sentenced to a 10 year prison term. The United States and human rights defenders from the European Union considers a political prisoner, and an official statement from Russia's Ministry of Foreign Affairs called the judgment "striken in its cruelty". According to a report of Transnistrian state agency Olvia, 4 members of the opposition group "Equal Rights" were arrested by Moldovan Special Forces. Under police pressure, they were forced to sign a prepared confession without reading it. Police then threatened to plant narcotics and remove their kidneys, in order to sell them on the black organ market. While under arrest, they heard screams of torture from nearby cells. Given that the definition of ethnic groups is the subject of an ongoing dispute, the following data must be taken with caution. The main controversy, concerns the identity between Moldovans and Romanians, as well as between the corresponding Moldovan and Romanian languages (see Moldovan language). The distinction between Moldovans and Romanians has been a greatly disputed political issue with one side arguing that Moldovans constitute an ethnic group separate from the Romanian ethnos, whereas others claim that Moldovans in both Romania and Moldova are simply a subgroup of the Romanian ethnos, similar to Transylvanians, Oltenians, and other groups (see Moldovans). Note: Transnistrian authorities published only the percentage of ethnic groups, number of people was calculated from those percentages. Number or percentage of Romanians in Transnistria was not published, it is included in "others". The census includes at least some Moldovans who had been living abroad over one year at the time of the census. The precision of numbers about nationality/ethnicity and language was questioned. Some enumerators apparently encouraged respondents to declare that they were "Moldovan" rather than "Romanian", and even within a single family there may have been confusion about these terms. Also it is unclear how many respondents consider the term "Moldovan" to signify an ethnic identity other than "Romanian". The official language is Moldovan; this is by all accounts a form of Daco-Romanian and is essentially the same as Romanian. There is no particular linguistic break at the Prut River, which divides Moldova from Romania. In formal use, the languages are identical except for minor orthographical issues (the Moldovans write î in some contexts where Romanians would use â; this same form used to be normal in Romania). There is, however, some regional variation, as might be found within any linguistic territory, and the common speech of areas such as Chişinău or Transnistria can be distinguished from the speech of Iaşi, a Romanian city that is also part of the former Principality of Moldavia. In general, the larger the Slavic-speaking population of a region is, the greater the difference from standard Romanian. Opinions vary on the status of Moldovan as a language. Most linguists consider standard Moldovan to be identical to standard Romanian, an Eastern Romance language, although one Moldovan linguist disputes this. 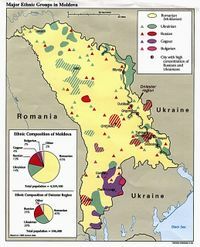 There are, however, more differences between the colloquial spoken languages of Moldova and Romania, most significantly due to the influence of Russian in Moldova which was not present in Romania. The matter of whether or not Moldovan is a separate language is a contested political issue within and beyond the Republic of Moldova. The 1989 law on language of the Moldavian SSR, which is still effective in Moldova according to the Constitution , asserts the existence of "linguistic Moldo- Romanian identity". A significant minority speaks native Russian, and there are more Slavicisms in common speech in Moldova than in common speech in Romania. Nonetheless, Moldovans are generally aware when they are using a word of Slavic origin not found in common Romanian, and are capable of choosing whether or not to use these words in a particular context. After 2001, when Communist Party arrive in power, Russian is used as a de facto official language alongside Moldovan (Romanian), despite not having legal status. As of 2006, 3 members of Moldovan government were not able to speak Moldovan, the main language used in government meetings being Russian. Title I, Article 13 of the Moldovan Constitution, names it the "national language" (limba de stat) of the country. In the unrecognized state of Transnistria, it is co-official with Ukrainian and Russian. In 2004, the investments volume on the telecommunications and information market in Moldova increased by 30.1% in comparison with 2003, achieving 825.3 million lei (65.5 million US dollars). The representatives of the National Agency for Telecommunications and Information Regulation communicated that 451 million lei (35.9 million dollars) were invested in the field of fixed telephone communication. Investments constituted 330 million lei (26.2 million dollars) in the field of mobile telephony, 24.2 million lei (1.9 million dollars) in the field of Internet services, 19.1 million lei (1.5 million dollars) in the field of cable television services. An essential increase of 163 million lei (12.9 million dollars) has been achieved in the field of mobile telephony. In comparison with 2003, investments in this sector practically doubled. An insignificant increase was registered in the other market segments, but the investment volume remained the same in the field of fixed telephone communication. In 2005 the volume of investments in telecommunication and information technology exceeded the level of the previous year, primarily due to the investments of the national operator of the stationary telephone communications of the Joint-Stock Company “ Moldtelecom” for the implementation of the technology CDMA (Code Division Multiple Access), by the investments of the operators of mobile telephony “ Voxtel” and “ Moldcell” in the development of infrastructure, also by means aimed at the extension and improvement of access services to Internet by new broadband technologies. Located geographically at the crossroads of Latin and Slavic cultures, Moldova has enriched its own culture adopting and maintaining some of the traditions of its neighbors. The Prince Dimitrie Cantemir is one of the most important figures of Moldavian culture of the 18th century. Cantemir wrote the first geographical, ethnographical and economic description of the country in Descriptio Moldaviae (Berlin, 1714). 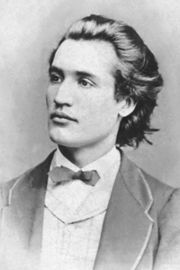 Mihai Eminescu was a late romantic poet, probably the best-known and most influential Romanian language poet.